The good news? 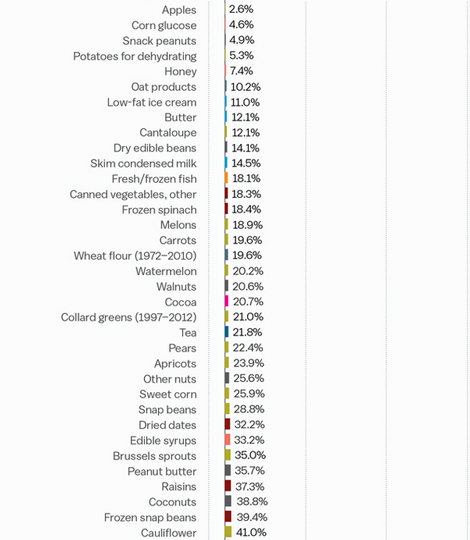 We're eating more fruits and vegetables. The bad news? We're using way more corn syrup. 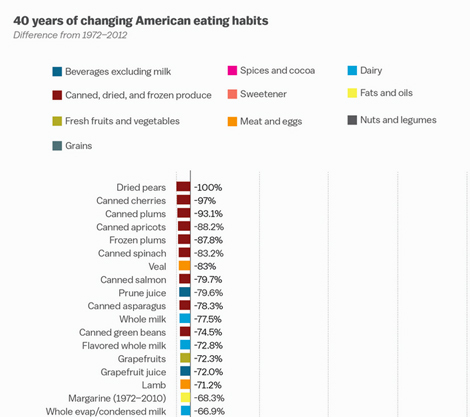 In a mindboggling new chart, Vox has magnificently illustrated the shift in America’s diet over the past 40-plus years, beginning in 1972 when the USDA started tracking the per capita availability of individual foods. 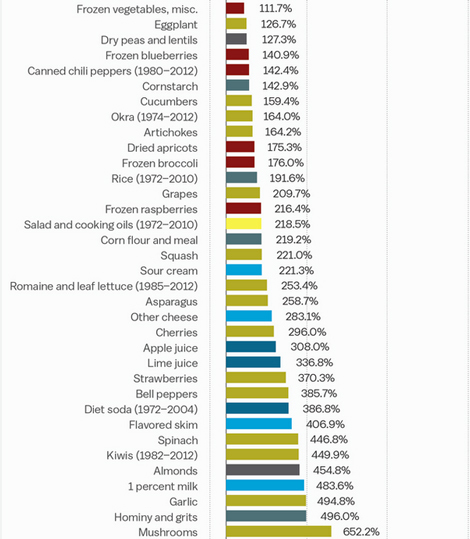 While there’s been an overall rise in the amount of fruits and vegetables consumed by Americans (good news!) 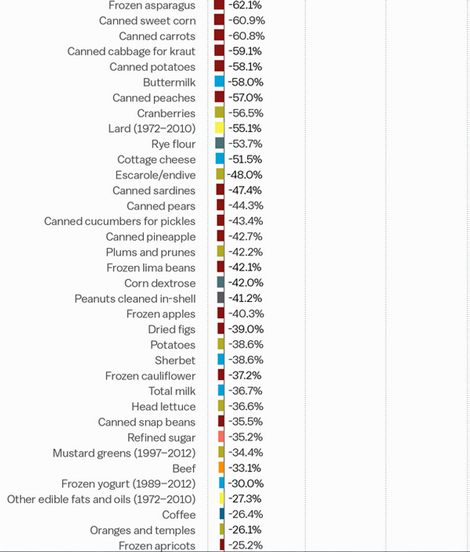 and a precipitous drop in canned food-based dining, the amount of corn syrup around today has really gone off the rails: its usage has increased almost 4000%. 1. Most ripe for a comeback: Veal (-83%), lard (-55.1%), and lamb (-71.2%): Curiously, lamb, veal, and lard (!) all have seen steady declines over the past few decades. In the next four decades, expect this to reverse. 2. 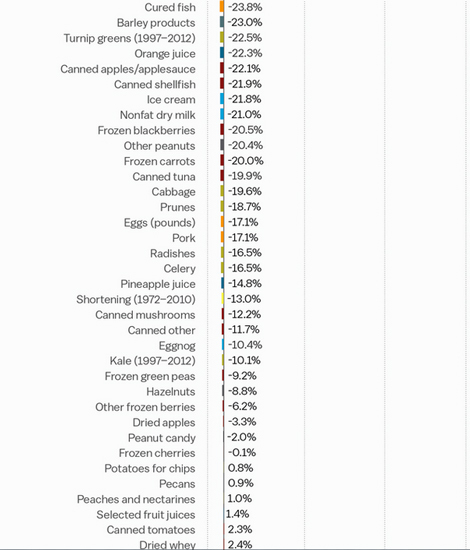 Biggest frozen trend-food drop off: Frozen yogurt (1989-2012, -30%): Let’s face it, in this post-Snackwell’s, post-Clearly Canadian era, we’re all just a little bit more likely to eat regular ice cream in place of froyo (other frozen dairy products have increased ~41%). 3. Biggest holiday-season bummer: Eggnog (-10.4%): Eggnog is dead, long live eggnog. 4. 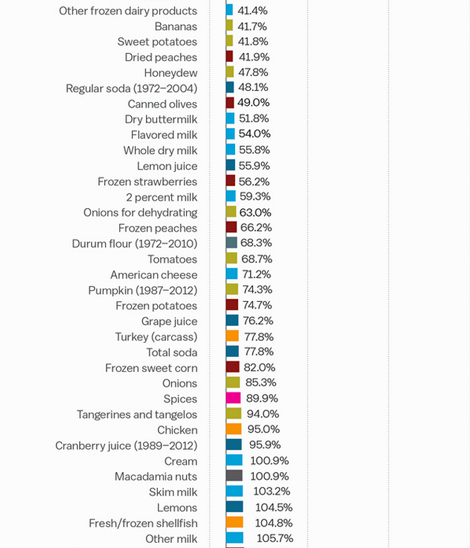 Biggest dried fruit shockers: Dried dates (+32.2%) and dried apricots (175%): While practically every other type of dried fruit took a tumble, date and apricot usage has actually increased for some inexplicable reason. 5. Southern food explosion: Okra (164%) and grits (496%): It’s difficult to imagine a time when biscuits and fried chicken weren’t trending nationwide, and yet, it existed.